These examples of Caddo pottery from the TARL collections only hint at the extraordinary variability in vessel form, decorative technique, and size that characterizes the Caddo pottery tradition. Photo by Sharon Mitchell. Patton Engraved rectangular bowl, an usual form. Historic Caddo, after A.D. 1650. TARL collections. Click on image to see enlarged version and an alternative view looking from top. About 1200 years ago (ca. A.D. 800), ancestral Caddo potters began making pottery that is unmistakably Caddo because of the particular combinations of material, design, and execution. 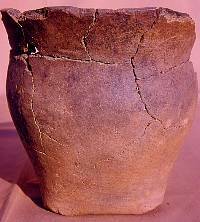 Early Caddo pots were usually made of clay mixed with grog (pulverized pottery sherds) or sometimes bone. The vessels varied considerably in form and decoration, but two forms are particularly characteristic of early Caddo pottery: bottles with long, slender necks and carinated vessels, both bottles and bowls. 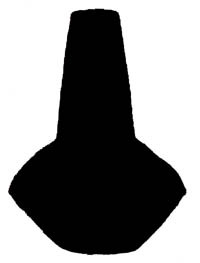 "Carinated" vessels flare out from the base and then sharply turn inward toward the rim, creating a distinctively angled profile (side view) that resembles the V-shaped keel of a boat turned on its side. Both bottles and bows were usually polished and decorated with engraved and incised patterns. There were many variations as well as other forms and design techniques, but bottles and carinated vessels remained part of the Caddo pottery tradition for about a thousand years, from A.D. 800 to 1800. We now know quite a bit about the Caddo pottery tradition and how it changed over time. Archeologists have been amassing and studying ancient Caddo pottery for almost a century. Understanding or even just thoroughly describing the ancient Caddo pottery tradition is no easy matter. This is because, among other reasons, Caddo potters executed countless variations on a great many themes a 1000-year time span. And they made lots and lots of pottery. Every hamlet and village (and probably every extended family) had potters and there were dozens of Caddo communities. Just as there was no unified Caddo tribe until the late 1800s, there was not really a unified pottery tradition, but dozens of local traditions reflecting the diversity of Caddo peoples. Add it all up and it is reasonable guess that at least several million pottery vessels were created by Caddo potters. 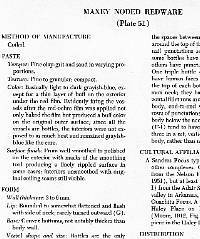 No grand synthesis has been written about Caddo pottery and there may never be one simply because the topic is so immense. Early historic accounts and cross-cultural studies suggest that the Caddo pottery tradition was created and maintained by women, as is the case among most comparable societies in the pre-industrial world. Caddo women probably passed on the tradition mother-to-daughter (or aunt-to-niece) from one generation to the next in much the same way that Caddo men passed on weapon-making and hunting skills to their sons (or uncles to their nephews). (Caddo kinship terms suggest that maternal aunts, the mother's sisters, probably played major roles in helping raise and educate their nieces, as did uncles with their nephews.) As you might expect, we find superb examples of pottery obviously created by master potters at the height of their abilities as well as really crudely-made pottery that is likely the work of unskilled girls just starting to learn. We also see a great deal of variation across the Caddo Homeland in part resulting from different clay sources and, more importantly, from different local or group traditions within the Caddo world. Some communities seemed to have favored particular forms and decorative styles more than others. In some cases these differences seem to have persisted through time, suggesting that different communities or groups maintained their own distinctive local traditions. As archeologists see it, Caddo potters made two kinds of pottery, fine ware and coarse ware or utilitarian pottery. The coarse wares were ordinary cooking and storage pots, made for everyday use. These were typically made rather plainly with thicker walls and coarse temper (see below) so they would be sturdy and, in the case of cooking pots, so they could be put directly on a cooking fire. Caddo fine wares were made to used in contexts where they would be admired. They were often polished, almost always decorated, had relatively thin walls and fine temper. Fine wares were used in serving food and drink and for special purposes, including religious ceremonies and to accompany the dead in the afterlife. 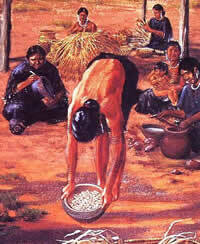 It is mainly the fine ware tradition for which the Caddo were and are celebrated. Archeologist Frank Schambach thinks that male potters may have taken part in the Caddo fine ware tradition. He bases this idea on the finding of a grave at the Ferguson site in southwest Arkansas that contained three skeletons accompanied by large lumps and smaller patties of unfired clay (of two types), and five smooth pebbles. He interprets the artifacts as a potter's kit and notes that the principal individual in the grave was an adult male (the other two individuals are seen as those of retainers). While we cannot rule out the possibility that some Caddo potters may have been men, early and later historic accounts that mention pottery making, associate the activity with women. Early Caddo carinated bowl form. Late Caddo carinated bowl form. 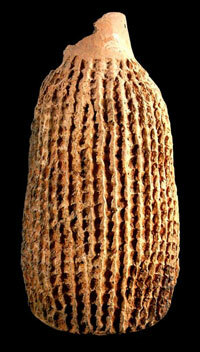 Unusual bottle resembling a corn cob stripped of its kernels. The highly textured surface was formed by carefully positioned rows of finger pinch marks obviously created while the clay was still wet. (Only one small section of the rim is intact.) Killough Pinched bottle, Late Caddo, ca. A.D. 1400-1650. TARL collections. Click to see enlarged view and detail of pinching. Variations on a Carinated Bowl: These three bowls dating to the Late and Historic Caddo periods illustrate some of the stylistic variability across the Caddo Homeland. The small bowl on the left is from the Hatchel site (Upper Nasoni village) on Red River, Bowie County, Texas. The other two bowls are larger. The one in the middle is from a site on Cypress Creek, Cass County, Texas, while the one on the right is from the Taylor Farm site in the Sabine River drainage in Harrison County, Texas. TARL collections. Click on images to see enlarged views and more details. Odd little pot with four, spiked handles. 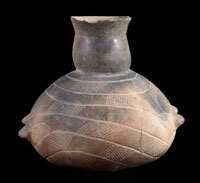 Nash Neck Banded jar, Late Caddo, ca. A.D. 1400-1650. TARL collections. Example of the use of white pigment (probably kaolin) to fill the engraved lines, thus heightening the contrast with bright red bowl. Ripley Engraved bowl, Late Caddo, ca. 1400-1650. TARL collections. Small engraved bottle with highly unusual "spiked gaping mouth." 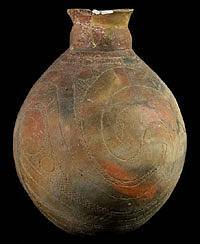 Taylor Engraved bottle, Late Caddo, ca A.D. 1400-1650. TARL collections. Looking down into small triangular engraved bowl. Untyped, Late Caddo, ca. A.D. 1400-1650. TARL collections. Click on image for enlarged view and alternative view. 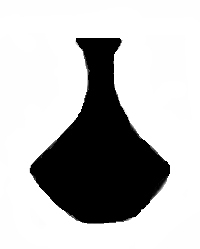 Hodges Engraved bottle with unusual oblong form and pairs of nodes at both ends. Late Caddo, ca. A.D. 1400-1650. TARL collections. Miniature pottery probably made for children. Untyped, Historic Caddo, after A.D. 1650. TARL collections. These decorated jars are believed to have been made at the Brazos Reserve in the 1850s. These two and another similar pot are in the Brooklyn Museum and were collected by medical doctor. The vessel form and decorative designs are immediately recognizable as Caddo in origin and probably derived from one of the Kadohadacho groups. They show that the fine ware tradition survived into the mid-1850s. Drawn by Nancy Reese. From Perttula, 2001. Why do the archeologists who study the ancient Caddo spend such an inordinate amount of time and effort excavating, reconstructing, and studying Caddo pottery? For archeologists, Caddo pottery is the prime evidence used to identify and date ancient traces of the Caddos' past. Lacking potsherds, we could scarcely identify the vast majority of Caddo archeological sites as being Caddo. 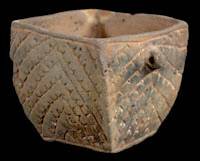 While there are many other distinctive kinds of archeological evidence of Caddo life, such as house patterns, pottery remains indispensable for understanding the past for three main reasons. 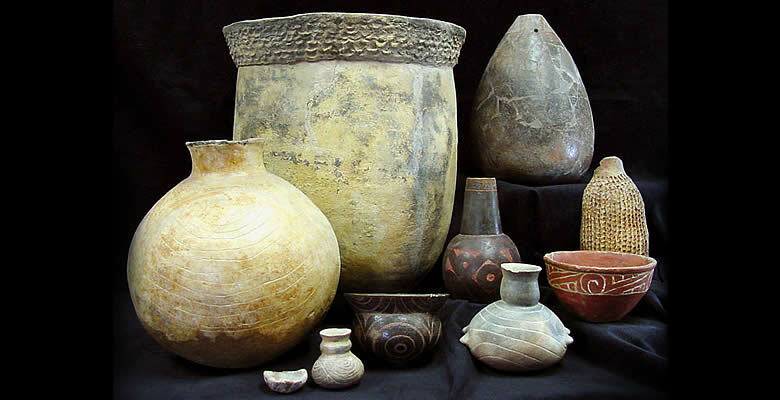 First, the ancient and early historic Caddo were superb potters and made and used lots of pottery. Sites representing small farmsteads where a single family once lived for short durations will have hundreds of potsherds. Villages and ceremonial centers often have tens or hundreds of thousands of potsherds and, in graves, many whole or almost whole pots. Secondly, pottery is relatively durable and can often be identified by style and form even when broken into small fragments. Thirdly, Caddo pottery is tremendously varieddifferent forms or shapes, different decorative designs, different colors, different finishes, different sizes, and so on. 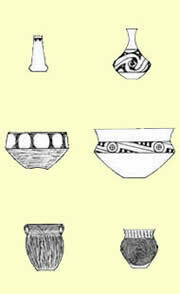 Further, pottery styles and preferences changed through time and varied from place to place within the Caddo Homeland. Given the right sherd, an expert often can tell approximately where the pottery was made and how old it is, give or take a few centuries (or sometimes a few decades). This is because we know what whole Caddo pottery vessels look like. Whole pots are also found in other contexts besides graves, especially on the floors of houses. For instance, over 30 vessels of various sizes and forms were recently found on the floor of a house at the Tom Jones site in the Little River Valley in Arkansas. Most of these were broken by the collapse and burning of the house. (Many pots included as grave offerings are also broken.) 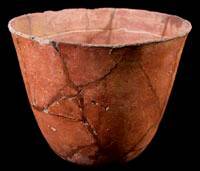 For the archeologist, a reconstructed pot is every bit as informative as a never-broken vessel. The ancient Caddo tradition of including offerings of pottery in graves has led to the excavation of thousands of Caddo graves, some by archeologists and many more by looters ("pothunters") seeking pottery for personal collections and, increasingly, to sell for profit. No one really knows how many, but tens of thousands of vessels have been removed from Caddo graves. Many are traded or sold on the antiquities market in the United States, Europe, and Asia. Some spectacular Caddo vessels are rumored to have sold for over $20,000. Even ordinary Caddo pots can bring hundreds of dollars on the market. Caddo people are conflictedthey want to honor their ancestors, but they are not sure that reburying all grave goods and bones in mass or separate graves hundreds of miles from their original resting places, as some tribes have chosen to do, is the right thing to do. Another possibility being considered by the Caddo is to expand their own tribal museum so that pottery vessels and other grave goods can be treated properly and preserved for future generations as sources of pride and knowledge about the past. Regardless of what happens in the future, Caddo pottery was important to the ancient Caddo, it is important to the Caddo Nation today, and it is important to anyone who wants to understand ancient Caddo history. When we say that the Caddo pottery tradition began about A.D. 800, we do not mean to imply that earlier ancestors of the people known today as the Caddo weren't already making pottery. Clearly they were. But we do not know exactly how, when, or even where, the Caddo pottery tradition was first established. Partly this is because it is often impossible to recognize the origin or beginning of any complex phenomenon in the ancient past. And partly it is because we have so few well-excavated and well-dated Late Woodland and early Caddo sites. In part, the Caddo pottery tradition grew out of the Fourche Maline pottery tradition that developed during the Middle and Late Woodland periods. Like early Caddo pottery, Fourche Maline pottery was usually grog or bone tempered and it was sometimes burnished. 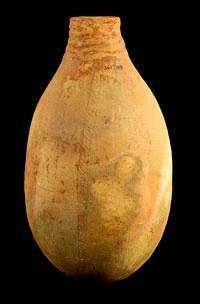 But Fourche Maline pottery was rarely decorated and it is very thick-walled in comparison to the Caddo fine wares. Vessel forms are also very different between the two traditions. 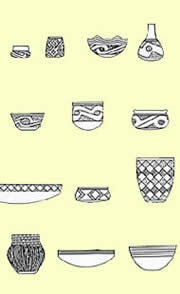 Some of the favorite Caddo decorative techniques, incising and punctating, are found on Fourche Maline pots, but most of the designs are very simple. The inspiration for these decorative techniques almost certainly lies to the southeast in the Woodland cultures of the lower Mississippi Valley (LMV). Beginning with Tchefuncte pottery (800-200 B.C.) and continuing on into the Middle Woodland period (200 B.C. 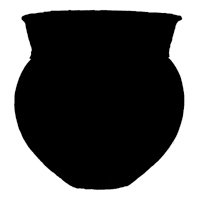 to A.D. 500) with Marksville pottery, incised, stamped, and puncated designs were common. Trade pieces of Tchefuncte and Marksville pottery are found in the Caddo area. By Late Woodland times (ca. 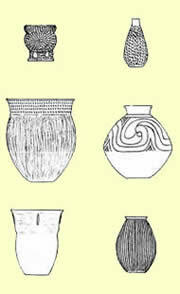 A.D. 500-800/900) Fouche Maline potters began to copy the designs of Coles Creek pottery from the LMV. 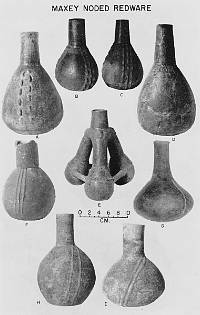 The origin of the technique of filling the engraved patterns with pigments and the origin of the distinctive early Caddo vessel formslong-necked bottles and carinated bowlsis not known. We do not see clear precedents in the Woodland-period pottery of either the Caddo Homeland or the Lower Mississippi valley, or the central Mississippi valley, or the Arkansas Basin. Therefore, we suspect that one of two things happened: ancestral Caddo potters invented these techniques for themselves or they borrowed the ideas from distant cultures. Archeologists have struggled with explaining the origin of highly specific behaviors for decadesare these "independent inventions" or the result of the "diffusion" (spread) of ideas or of things like domesticated plants? In the 1940s, Alex Krieger and Clarence Webb, like many of their contemporaries, favored the diffusion explanation. These Caddo scholars and other prominent American archeologists of the day pointed to seemingly close parallels between Caddo pottery and the pottery of certain Mesoamerican cultures in what is today Mexico and Guatemala. They could not explain how the contact between these very different and widely separated (in space and time) cultures took place. Nor could they point to positive evidence of direct contact, such as the finding of a pot made in Mesoamerica at a Caddo site (or vice versa). 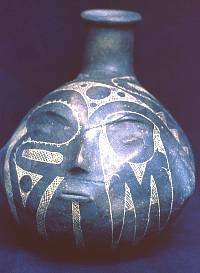 Caddo archeologists today reject the notion of a Mesoamerican origin and see the Caddo pottery tradition as an independent development influenced only by neighboring peoples living mainly to the east along the Mississippi River and along the Gulf coast. The diverse Caddo pottery tradition bears witness to the obvious inventiveness of Caddo potters and their willingness to experiment. It is worth pointing out that there are a great many cases across the world of the obviously independent invention of specific forms of pottery making and decoration. Carinated pottery, long-necked earthenware bottles, and engraved designs with pigment all occur in many places in the world that are separated by thousands of miles or thousands of years (or both). For instance, carinated pottery forms similar to those of the Caddo tradition are also found in Mesoamerica, South America, Africa, Europe, and Asia. Thus it seems likely that about 1200 years ago, ancestral Caddo potters began to develop their own distinctive pottery tradition by combining the established ways of making pottery (the Fourche Maline tradition and probably that of the Mill Creek and Mossy Grove traditions) with inspirations from neighboring peoples, and creative new ideas cooked up, so to speak, in Caddo villages by Caddo potters. By A.D. 1000, the Caddo pottery tradition was firmly established and distinct from all others. After A.D. 1400, Caddo pottery became more diverse in form and, especially, in decorative technique and style. Caddo potters developed (or borrowed) new decorative techniques including appliqué, trailing (wide incisions, often curved), brushing, and a great many combinations. Intricate scroll designs with ticked lines, incised circles, negative ovals and circles, triangles, and ladder designs are all common in late Caddo pottery. Jar forms seem to have become more important and bottles somewhat less so. New specialized vessel forms such as rattle bowls and "tail-rider" effigy bowls appear, the latter closely resembling vessel forms in northeastern Arkansas. Very rare examples of Caddo pots made in the style of Mississippian head pots are also known. The invasion of European peoples and the attendant catastrophic impacts on the Caddo (population loss, forced moves, changing economy, etc.) brought about a relatively quick end to the Caddo pottery tradition. For a time in the late 17th and early 18th centuries Caddo women were able to keep making beautiful and distinctively Caddo pottery, but by the close of the 19th century, only vestiges of the tradition survived. The last Caddo pottery of the original tradition was apparently made in the late 1800s after the move to Oklahoma. Today, as can be seen in other sections of this exhibit, there is hope that the Caddo pottery tradition will be revived, at least as an art form. Of course the tradition will never be the same without the existence of the societies that kept it going. Modern Caddo people use store-bought pots and pans, just like everybody else in the developed world. Finely crafted Holly Fine Engraved bowl, Early Caddo, ca. A.D. 900-1200. TARL collections. Click to see top view. Looted Caddo cemetery in northeast Texas. Photo courtesy Texas Historical Commission. 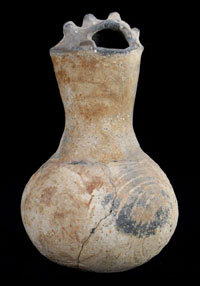 Late Caddo bottle with poorly smoothed neck bands and faint ladder-like design on main body. Hume Engraved bottle, ca. 1400-1650. TARL collections. Click on image for enlarged view and detail of neck. 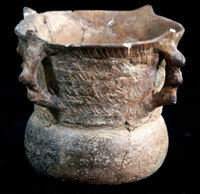 A rare Late Caddo "head pot" from southwestern Arkansas. The Caddo master potter who made this extraordinary piece obviously copied a typical Mississippian head pot, but decorated it with Caddo style engraving rather than painting. The engraved designs may mimic facial tattooing. Courtesy Picture of Records, original in the Henderson State University Collection, Arkadelphia, Arkansas. These peculiar little vessels are rattle bowls. The protruding nodes are hollow and contain small pebbles or rounded pieces of clay that rattle when the bowl is shaken. Late Caddo, ca. A.D. 1400-1650. TARL collections. Click to see enlarged view and close up of one bowl. 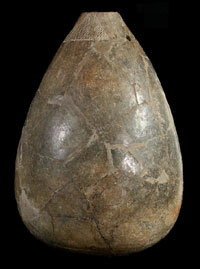 Large tear-drop or gourd-shaped Sanders Engraved "seed pot," so-called because of the small restricted mouths. 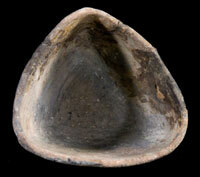 In fact, there is no definitive evidence that such vessels were used to store seeds. This one is much too thin to have been a water jar and it does have small holes near the rim that were probably used to secure a lid, lending support to the seed pot notion. Middle Caddo, ca. A.D. 1200-1400. TARL collections. Click to see enlarged view and detail of rim. 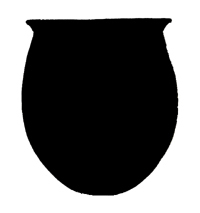 Typical Fourche Maline jar with thick walls and a shape resembling a flower pot. This Williams Plain pot is from the Crenshaw site, Miller County, Arkansas. Photo by Frank Schambach. Detail of artist's depiction of daily life in an Early Caddo village. The woman on the far left is engraving a bowl. Courtesy artist George Nelson and the Institue of Texan Cultures. Early Caddo (left two) and Late Caddo (right two) pottery forms. Click on each image to see enlarged view. From Krieger, 1946. Charming effigy bowl depicting either a deer, or as some see it, a dog. Fulton Effigy bowl, Late Caddo, ca. A.D. 1400-1650. TARL collections. Title page of original An Introductory Handbook of Texas Archeology, published as Volume 25 of the Bulletin of the Texas Archeological Society. This two-part volume has been both a blessing and curse to those who would study Caddo pottery. 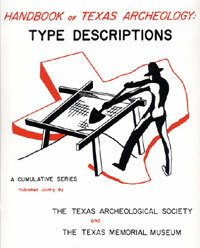 Cover of 1962 Handbook of Texas Archeology: Type Descriptions, Texas Archeological Society. Although some of the information is badly outdated, this volume is still an important reference. Using it uncritically often leads to faulty interpretations. Small untyped engraved bowl with a crimped rim. The engraving is poorly executed, perhaps by a child? Possibly Middle Caddo, ca 1200-1400. TARL collections. Exuberant form with unusual fluted rim. Untyped bowl, Late Caddo, ca. A.D. 1400-1650. TARL collections. Faced with an incredibly diverse and long-lived Caddo pottery tradition, archeologists have devoted much attention to classifying pottery into meaningful groupings of similar forms and styles. We do this because, by understanding differences in pottery style, manufacture, and form through time, we gain a better understanding of ancient Caddo societies. In doing so, archeologists try to balance the need for convenient labels for groups of similar pottery vessels, usually called "types," with the need to recognize variation within and among types. This problem is not at all unique to Caddo pottery or even to pottery. Archeologists the world over need to classify artifacts into meaningful categories in order to communicate effectively and to be able to recognize and define artifact patterns across geographic space and over time. Countless scholarly articles and dozens and dozens of books have been written on the subject of classification. This archeological preoccupation need not concern us here, but you might want to know a bit about how Caddo pottery is classified. In this exhibit and elsewhere in the Tejas exhibits, the names of various pottery types, like "Holly Fine Engraved" and 'Maxey Noded Redware" are often given. These type names are really nothing more that convenient labels for groups of pottery that share similar forms, similar manufacturing methods, and similar designs. The presumption is that particular types of pottery were made at roughly the same time and within specific areas (which may represent individual communities or many related communities). Types reflect, we archeologists like to say, the existence of "mental templates" or shared ideas of how a pot should be properly made, ideas that changed through time and changed from area to area. In Texas, pottery classification was first formalized when archeologists Dee Ann Suhm (now Story), Alex Krieger, and Edward Jelks got together in the early 1950s and put together what has become thought of as the "bible" of Texas archeology. 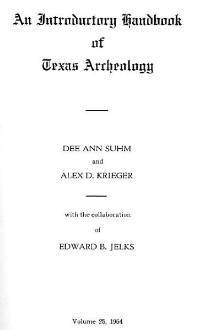 It was originally introduced in 1954 as An Introductory Handbook of Texas Archeology and had two parts. Part 1 reviewed what was then known about the archeology of different parts of Texas and Part 2 defined various major types of pottery and stone tools that archeologists had recognized in Texas and adjacent areas. In 1962, Part 2 was reissued, with larger pages and minor revisions, as Handbook of Texas Archeology: Type Descriptions, by Suhm and Jelks. It is unfortunate that, too often, the Handbook has been thought of, and used, as a bible whose type descriptions are set in stone, so to speak. Nothing could be further from the author's original intentto provide a good summary and first approximation of a useful classification system of pottery and stone artifacts. The Handbook was intended to be revised and supplanted by better information and new ideasthe 1962 version was even issued in a ring binder so "type sheets" (most types are described on one side of a sheet and illustrated on the other) could be added and deleted as knowledge improved. This revision process did not happen, at least not in a consistent published form. Instead, each archeologist has interpreted and refined existing types and defined new ones to suit his or her immediate purpose. As we know more and more about the archeology of a region, the more impossible the job becomes to create a new and improved comprehensive handbook. While the existing Handbook is still useful as a general reference, many of its statements, educated guesses, and groupings are no longer considered valid. Since the 1950s archeologists gradually have realized that we ought to be paying more attention to the variability than the commonalities represented by "types." 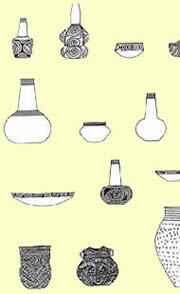 The most common solution for pottery classification is the Type-Variety system. Basically, the "types" are the major groups of pottery that share similar attributes (look similar to one another), while the "varieties" are subgroups within types that have particular combinations of attributes (and look very similar to one another). Archeologists in Arkansas and Louisiana, especially those working in or near the lower Mississippi Valley, have spent much time defining many varieties of established types (as well as new types). This, too, has proved very cumbersome and difficult to keep up with. Plus, we can see that many types of attributes and even combinations of attributes occur in many varieties and types. Design "motifs" (such as nested centric circles or parallel ticked lines) in particular, seem to cross-cut existing groupings (types and varieties). To address these problems, Arkansas archeologist Frank Schambach and several of his colleagues devised a more-detailed approach to describing and analyzing Caddo pottery that creates a hierarchy of "classes" and "patterns" of decorative techniques. This approach has proven useful in detecting fine-scale changes in pottery design through time along the Red and Ouachita rivers in Arkansas and Louisiana. 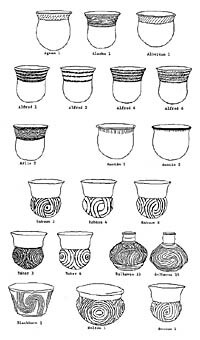 At a class level, it can be applied to potsherds, although as the illustration to the right shows, at the pattern level the distinctions are based on what whole pots looked like. Pottery classification is not a goal, it is a tool used to help understand variation and to help those interested in archeology communicate with one another. Establishing pottery types is just the first step. The steps that follow are more interesting, more important, and a lot more challenging. For instance, when archeologist Peter Thurmond took a close look at the pottery from a series of Late Caddo archeological sites in the Big Cypress Creek drainage system of northeast Texas and northwest Louisiana, he was able to define small geographic clusters of specific types and varieties of pottery. While all these clusters fall within the time period and area known as the Titus phase, they appear to reflect several of the actual Caddo societies of the day. Each cluster represents, we think, the territory of a social group equivalent to (but different from) the named groups encountered by the earliest European explorers a few centuries later. Bowl with engraving on the interior, a very unusual location. Simms Engraved, Late Caddo, ca. A.D. 1400-1650. TARL collections. Click to see enlarged view and detail of interior engraving. Type examples, Maxey Noded Redware, Plate 51, Handbook of Texas Archeology: Type Descriptions, Texas Archeological Society, 1962. Type description, Maxey Noded Redware, Handbook of Texas Archeology: Type Descriptions, Texas Archeological Society, 1962. Example of two classes and various patterns as defined for Late Caddo pottery from the Cedar Grove site, Lafayette County, Arkansas by Schambach and Miller, 1983. Top three rows are Class A, while the bottom three rows are Class B. Courtesy Arkansas Archeological Survey.